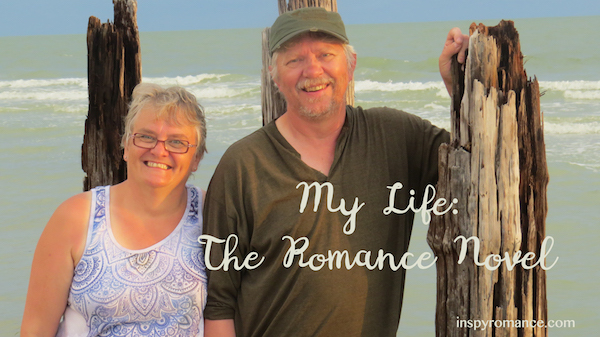 I’m sure you know that every romance author’s life is just as full of fluttering eyelashes, words of endearment, and sweet kisses as the the life of the heroines in her books. What our lives are full of is conflict. How enthralled would you be by a story if two characters met, fell instantly and breathlessly in love, vowed their lives to each other, and rode off into the sunset with nary a harsh word or misunderstanding? It’s conflict, also known as tension, that makes readers turn pages. And frankly, last week, it was conflict, also known as unpleasant circumstances, that made me want to turn the pages… and get through this chapter of life, already! On Sunday, as I was cooking lunch, the power flickered once and went out. Cloudy outside, yes. Storm? No. I stared across the room at my wall-mounted computer and its blank screen. Would there be a surge when the electricity came back? Best not to chance it. I unplugged the machine, my husband’s laptop, and a few other electronic items. After lunch, I began to wonder what had caused the outage so logged into a local news Facebook page on my phone. A car accident had taken out a power pole, and the estimated time of repair was still many hours away. I wasn’t worried about the manuscript I had been working on (other than the looming deadline!) as I know the program I use, Scrivener, saves constantly. I have the Scrivener app on my iPad but couldn’t sync it with the computer or Dropbox, so I opened the manuscript with the next deadline and wrote a chapter on that file. Power finally resumed about 10pm. I noted it and went happily to bed. The next morning, I — first person, as my husband and son were both working out of town for a few days — had no water. We’re on a well out on the farm, and I was pretty sure that the pump had lost prime due to the power outage. “Someone” needed to prime it. That someone wasn’t going to be me but, after a couple of hours, my brother-in-law was able to come by. (Thank you, Dan!) All systems go. See how mean I could be to a heroine? I’m saving this all up. But a good story has more than one kind of conflict. On Tuesday, a friend phoned me to tell me her rheumatoid arthritis had flared badly with a rare reaction to a prescription drug. Her skin from head to toe was itchy, painful, and peeling, and she was in need of prayer and support. First things first. Called the septic tank pumper guy. He came and did his thing, which needed doing, but didn’t solve the problem. A few test flushes later, and the toilet was full, thankfully of clean water. I went outside to write a check for the guy and think about my next plan of action (making sure the holiday trailer had water and power, so I could use those facilities), came back in, and discovered several gallons of water on the bathroom floor… and out into the porch. Clean water, thankfully. Turned off the toilet valve as apparently it had sprung a leak. Mopped up the floor. And I thought about all the ways I could make my characters’ lives way more miserable than I ever had before. Three comparatively little things (power, water in, water out) and one big thing (health) that I have not used to full advantage in my novels yet. Hmm. Meanwhile, my wondeful husband arrived home from several long days at his physically demanding job and snaked out the sewer line. All systems are go. Again. And I have to tell you that, having been married 36 years (on August 30), I’ll take power, water in, and water out over simpering looks any day of the week. Real-life love tackles real-life problems and finds solutions. Real-life love tackles real-life problems and finds solutions. Now I’m ready to start a new story and see what havoc I can wreak! Look out, characters! Tell me about some real-life problems you’ve had that would make fodder for story conflicts, especially if it’s not a conflict you’ve seen in a romance novel! 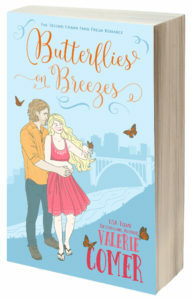 I’m offering two commenters a digital copy of Butterflies on Breezes. Winner to be announced in the August 28 Sunday Edition. I love how the adversity makes you think of great adventures! “Real-life love tackles real-life problems and finds solutions” I loved this line, Val. That’s such a great picture of you and your husband. Neither of us are photogenic enough to have a lot of romantic photos, but I do like this one a lot! Hi Valerie! Sorry to hear about your eventful week. When it rains, it pours! Life is full of problems and I have had my share of them, but with God’s grace and strength have muddled my way through. I am familiar with power outages not due to storms, because somebody hit a power pole or a transformer blew. One of the most stressful years in my life was 1997 – 1998. Just before midnight on July 5, 1997 the church parsonage had a devastating fire. We lost everything after 24 years of marriage. Our three sons ages 19, 16, and 7. For three days I searched the house and the woods for our new kitten Smokey, which we only had for a month. We finally found him in the woods. He was’t happy that it took us so long. Fortunately somebody at church had a house for us. Their father had just moved to a retirement home. The house was semi-furnitures. Through the help of friends, parishioners, and family we started to rebuild. On August 1, we had to put down our 12 year old Sheltie, who had started to deteriorate before the fire. This was hard on the kids. Then the end of August my dad had a major stroke and was hospitalized for three weeks. With barely a chance to recover or process what had happened school started. I am a high school teacher and this was my first year working full time, plus teaching two nights at the community college. Living in Michigan, every season was a challenge. To this day I hate shopping, because it was a year of shopping – first back to school clothes, then winter gear, then spring things, in addition to replacing household items. The house we were renting was 1,000 square feet smaller than what we were accustomed to with boys over six feet tall. Winter was trying as the living room and kitchen were tiny, especially Christmas. I put up a small tree, but our middle son is very sentimental and he begged for the full sized tree to be put up. The big tree took up almost the entire living room. Since the kids had been through so much – lost all their clothes, toys, wrestling gear, electronics; I relented and put up the big tree. Then in April 1998 we moved into the newly rebuilt parsonage with all new furniture, which had required many a shopping trip. Unfortunately for the next year we felt like we lived in Better Homes and Gardens. This was not our home. We had always lived in older homes and had a mixture of old and new furnishings. Now whenever I hear of a natural disaster – tornadoes, hurricanes, fires, earthquakes, or flooding my prayers go out. It was difficult enough to be the only family in the area going through a disaster, but we had a support system because our families homes, our friends homes, the school, the neighborhood was still standing. I can’t imagine having the entire community destroyed. Just south of our area, Sunday night northern Indiana received 8 – 10 inches of rain in just 6 hours, that is what our area usually receives all summer. The area is flooded. School, businesses, and the grocery story is closed. The zoo keeper went during the rain to check the animals at the Potawatomi Zoo and rescued a deer just before it drowned. Everything in that area is still closed today. Val, don’t want to take more space. If you need more tension, stress, conflict; send me an email. I have more! LOL – that is what 66 years of living does. What a traumatic time with the house fire! We had a fire in our home when I was a child. A curtain caught fire from touching an electric heater. Thankfully it was caught and put out before the whole home went up in flames, and damage was limited to the one room. Yes, the flooding in several parts of the USA is devastating right now. My problems last week are so miniscule they barely count in comparison. I can just imagine a scene involving the Heroine with a snake and she’s going to need someone to rescue her, now who could we give the job to…. There are lots of reasons I live where I live, Lientjie! I detest snakes so passionately I wouldn’t be able to live anywhere where they are common, especially deadly ones. Around here I’m (un)lucky to see a garter snake once a decade. Even that stops my heart a few seconds. I think I’ll leave writing this story to someone else! Some minor issues since then was running out of water in the middle of my morning shower one day because the building manager forgot to let us know he had maintenance scheduled, and not having hot water in the winter for about a week (this time apparently only in our apartment) until my husband managed to fix it. Wow, I can’t imagine living in an apartment building where everyone had to agree to share the cost of a roof repair. Around here that would fall squarely on the owner’s shoulders, and if the building were co-op owned, people wouldn’t have a choice to vote against it. Water can cause a LOT of damage! Yay for butterflies on breezes! :) and for conquering what life threw at you. Thank you for reminding me of all that I have. I will never complain again. Well, never is too strong a word, but you have indeed shown me I have many blessings. And yes, I take many of them for granted. I also know things can change in a heartbeat. Because of bad storms in our area, two readers posted on my timeline this morning, telling me they were concerned for our family. Life has issues and problems–from the minor annoyances to the full-fledged catastrophes at times. And yes, we plow through them and adapt or find solutions. But God’s got it all, and I always cling to His promises. Happy anniversary to you and Jim later this month! Blessings. Remembering our blessings is ALWAYS a good idea! And yes, in the grand scheme of things, last week was simply a string of annoyances. No one’s life was threatened. There is so much flooding going on right now in parts of the US that I feel guilty for complaining about my wee problems. I’m glad your family is safe from the deluge. A few years ago we had a bolt of lightning hit out house. God protected us from fire, but it ruined quite a few electronics and our AC/heat system. It was months before everything was back to normal. A few weeks ago (last time we were camping) lightning struck the farm. It hit our son’s place harder than ours and he lost several electronics. I could have added that to my litany but it wasn’t the same week and didn’t affect my life as directly. Depending on the time of year, losing AC/heat as you did can be a very large adversity! Hugs, Valerie! That truly IS what love is about. Real life. I think your heroines had better be afraid of what you might throw at them. Very afraid! Apparently I’ve been too easy on them all these years! Mwahaha! I know this isn’t unusual, and probably is extremely common, but we recently moved and since then have had more clogged and overflowing toilets than in the 10 previous years of marriage. I cannot handle plunging toilets. The sound and action completely turn my stomach and make me nauseous, so we’ve had many days of my husband returning home from work late at night only to have to plunge 1-2 toilets. Great post, Valerie! Here’s a short conflict: Imagine it’s late, you’re very tired, and finally finish the day’s chores and head to bed. All scrubbed and ready for sleep, you pull back the covers–and there’s a big, black spider! I still check every night before I crawl into bed. Most of the time I have no trouble killing spiders. Not sure I’d want a large one’s guts spread across my sheets, though! I have a big, manly brother-in-law who is terrified of spiders. Ah, now that would be a fun phobia to give a hero someday! Great post. Sounds like it has been quite a week! It was a wee tad crazy! My husband came home, I think, it was on a Wednesday, mid-to-late November 2004, upset about work. He’d been dealing with questionable ethics there as it was, but that day was the straw that broke the camel’s back (pardon the cliche). The boss had ranted at himfor 15 minutes before Gordon finally figured out what was happening, and when he came home and relayed the whole story to me, I told him it was time for him to leave that job, to quit. He spoke to his dad and to our pastor, both of whom said the same thing: Quit. He was out of work from then until late March, I believe it was. During December, Jamuary, and the first part of February, he and a good friend redid our 2 bathrooms. At this time our daughter was dealing with some health issues. She was in her 3rd year of college an hour away, and was seeing a therapist (we shared a therapist who was very good at keeping our issues separate! :) ) for PTSD (from memories of an old boyfriend when they were in high school) and was on an antidepressant. She was being prayed for, but still wasn’t doing that great. She was ready to change her minor from Art History to Art Therapy (her major was Studio Art) when something huge happened: She had a baby. Yep. Didn’t know she was pregnant (there’s a long story to it, but I won’t get into it here), but stopped school for the Spring semester, brought Paige home to our house, and returned to college that Fall. I was told in March that, because I was low in seniority, I would lose my job at the end of the school year (I was the Teacher Assistant in the primary school library). That was on my birthday. (We were living on my salary because my husband was still out of work, but my in-laws helped out tremendously.) The superintendent told me she would try to let me know by the time school let out if I would have a job for the next year, but that didn’t happen and she apologized for it on the last day of school. Our daughter returned to working at a local vet hospital (she’d worked there during high school) AND commuted 2 days a week to college an hour away, while I babysat our granddaughter. Wow, that is so SO much more devastating than my week! I was merely inconvenienced, really… God has his ways of working in our lives. I’ve had the same problem as Lientjie. A snake slithering through the front hall. Good news. Three hunkie fireman came to the house and got rid of him. LOL!!!!! You made me seriously laugh. Hope that’s in one of your books. What a meeting between heroine and hero! Wow, one aggravation after another! Hopefully it all worked out, and your kitties are happy. We’ve had lots of things happen over the years. We’ve been married 36 years also. Our youngest just graduated college and got married. When she was supposed to be starting her freshman year of college my husband had a stroke 4 days before we were to move her to college. I was in the hospital with my husband, our daughter was away on a missions trip, and our older children lived out of state. I was trying to figure out how I could take my daughter to college with my husband in the hospital. She was returning from her missions trip in time to go to college. My son called and said he was flying home and would help move Becky to college! My husband was released in time to ride with us, but felt badly,that he couldn’t help . We told him we were thankful he was with us! ! The Lord healed him from all stroke symptoms over several months. Today he walks, talks and has full use of his arm and hand! Wow, what a story! I’m glad he recovered. Again, timing, right? Our first week of marriage had some curve balls. To start us off, my husband had been working night shift so to switch to days for our wedding and honeymoon messed him up. Then, once we got on our honeymoon, I felt horrible one day and we had to basically hang around the hotel room. Then, my husband, who is a type 1 diabetic on a pump, ran out of pump supplies. He had brought the amount of supplies that he would usually use in a month but things kept going wrong and he used them all. On top of that he got sick (which either exacerbated the blood sugar problem, or the blood sugar caused the sickness….it’s a vicious cycle). So there we were, a thousand miles from home, trying to get syringes so he could keep his blood sugar manageable (pump supplies are only available mail order – and the insulin used is different) and spending way more time at Walmart or driving to and from Walmart than anyone should on their honeymoon. Then, to top it all off, we found out my husband’s first day back at work that he was going to be laid off. Believe it or not though, with all of that, we still had an awesome time on our honeymoon and came back with some great memories. And God definitely provided in the job situation. Wow. And more wow. Honeymoons shouldn’t have so much trauma on them! I feel for you on city driving. Yikes. And it was just plain mean of them to lay him off straight from his honeymoon! My heart goes out to Katy on her honeymoon. Praise God for getting her through the difficult situations and giving her some good memories. The only conflict my husband and I had on our honeymoon was keeping the Census person away from our rental house. In March 2000, we were honeymooning in the Smoky Mountains for 5 days. In that time we had seven visits from Census takers! We explained to the first three takers that we were from another state, using a rental unit, and on our “honeymoon;” plus we gave them the rental companies information to contact to get information on the home’s owner. After that we had one taker who visited early in the morning (7AM) and who had the audacity to go around the house and peep in the windows and knock on them! We finally had to call the local authorities and ask them to request the Census organizers restrain their workers. The last thing honeymooners want or need is a “Peeping Tom.” Thankfully the remaining takers visited while we were out of the house and only left the information. To add to that we took a trip in 2010 and had another encounter with a Census taker; thankfully that one was very polite and we had no other visits. Looking back, my husband and I can laugh at the unusual Census shenanigans, but we have decided that we may stay home for the 2020 census! I’m sure your story wasn’t nearly as funny while it happened as it sounds now! Yikes, that’s a lot of visits and a lot of audacity. Staying home during census week seems like a good idea. We had ours this spring in Canada. I definitely wouldn’t want to do LIFE with anyone else by my side! We’ve had all kinds of conflict in life this year. Multiple appliance repairs (by hubby, thankfully! including dryer, range, dishwasher, septic pump, fancy schmancy thermostat), vehicle needs new bearings again, flooring is water damaged, kids keep writing on and banging up walls, exterior light fixture needs replaced again, found tons of mold in our air handler in the basement, then my father-in-law had a stroke (7 weeks in hospital rehab, he’s home now), my husband was also moved to night shift BUT Praise the Lord, he still has a job and we have been able to pay all these unexpected expenses, He provides! Wow, that’s a lot! But your last comment is so true. God DOES provide.